In California, earthquakes are commonplace, but with the possibility of the ‘Big One’ always looming, the state’s authorities are doing all they can to prepare for it. This week saw the construction of a mock five-story hospital built upon a ‘shake table‘ that was subjected to a fake 8.8-magnitude earthquake. The test was conducted in order to see how a hospital would fair in a real disaster, and to evaluate the benefits of using rubber bearings in building construction. Rubber bearings are becoming more and more common in building construction, especially in Japan. But this $5m project was to see whether the bearings could protect “strategically important buildings”, such as computer data centers and hospitals, so that they could continue to operate without interruption after a large quake. The test was the first of its kind and aimed to see not only if the building would remain standing, but if the hospital staff could continue to function. 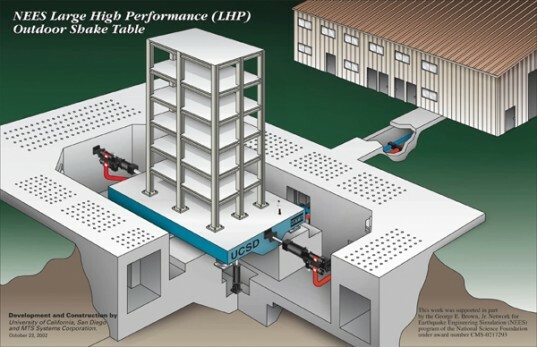 The shake table was also able to simulate earthquakes between 6 and 8.8 magnitude. “What the bearings do is uncouple the building from the motion of the ground during an earthquake, like putting the building on roller skates,” said Tara Hutchinson, an engineering professor at the University of California, San Diego speaking to the BBC. The team’s research focused on how the building’s contents such as stairs and elevators would function during the quake, and a surgery room, intensive-care unit, computer servers and other electrical equipment were also monitored. The 80ft (24m) structure was also clad in precast concrete and synthetic stucco (two materials commonly used in commercial construction projects) whilst a large water tower and a heating and air-conditioning system was installed on the roof. During two tests which replicated a 6.7 and an 8.8 quake, the team found that the rubber bearings successfully protected the building from most of the damaging lateral motion while lifts, stairs and other machinery suffered only minor cosmetic damage. Rubber bearings are now being implemented in buildings in San Diego and San Francisco. Watch the test in action below. In California, earthquakes are commonplace, but with the possibility of the 'Big One' always looming, the state's authorities are doing all they can to prepare for it. This week saw the construction of a mock five-story hospital built upon a 'shake table' that was subjected to a fake 8.8-magnitude earthquake. The test was conducted in order to see how a hospital would fair in a real disaster, and to evaluate the benefits of using rubber bearings in building construction.